Stream music by bands with upcoming concerts in your area. 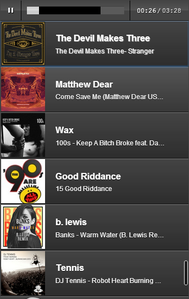 Band Wagon Playlist gets your location and finds nearby upcoming concerts. It then creates a playlist of songs by those bands, streaming them from SoundCloud. The site was designed with mobile devices in mind. You can swipe the screen left and right to get to the other pages. This works across all devices and browsers. 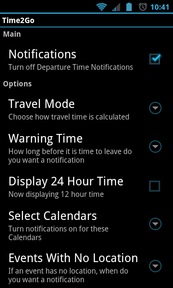 Get notifications when it is time to leave to make it to your events on time. Time2Go syncs with your Calendar, and uses Google Maps to get estimated travel time to your events with locations. It then gives you a notification when it is time to leave from wherever you are to get there on time. You can set your mode of transportation as Driving, Biking, Walking, or Public Transit. You can change the mode of transportation for a specific event by adding the keyword in the title of the event. If the title of the event is in your contacts list, Time2Go automatically retrieves their address. I created this app before Google came out with "Google Now" which includes very similar functionality. Although there are still a hundred or so users of Time2Go since for this specific function, Time2Go is more reliable and customizable. 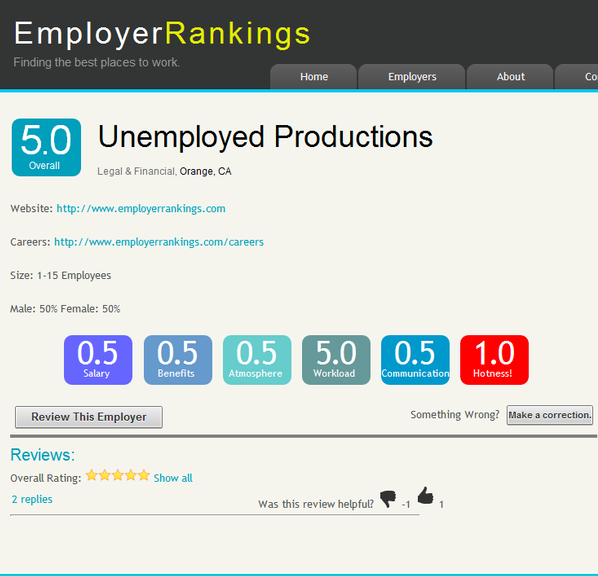 Based on the concept of ratemyprofessors.com, Employer Rankings is a resource for job-seekers to search for companies by location and industry while reading current and previous employees' reviews. This was an idea a friend and I came up with after having trouble searching for a job, and being frustrated with the currently available resources. Search for companies by location and industry while reading current and previous employees' reviews. Sort companies by user ratings in different categories. If there were thousands of reviews, this could be a great resource for finding where the best places to work are in a certain area or industry. Original Radio takes the concept of Pandora and applies it to original music. Rather than finding similar songs, it will try to compose its own new music that sounds similar. Users enter any midi file they enjoy, and it will respond by creating similar but original midi files. Just like in Pandora users can “Thumbs up” or “Thumbs down” any particular piece it creates, and it will try to adjust how it creates future pieces according. Original Radio analyzes the initial midi by finding probabilities for where each given pitch, rhythm, duration, or dynamic of a note tends to go next. 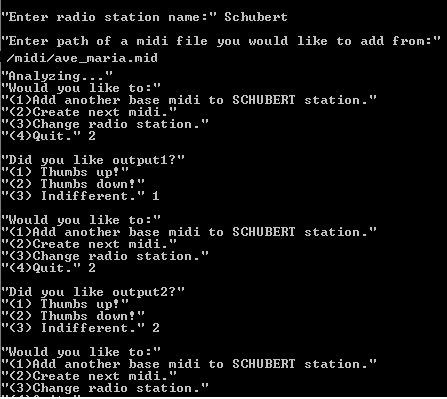 It then creates a midi based on these probabilities arranged for a random set of instruments. From there, a thumbs up will increase the probability of the chosen instruments and all the chosen pitches, rhythms, durations and dynamics. A thumbs down will decrease the probabilities for the attributes of what was created.